Thanksgiving Day is coming faster than you think, and if you are tempted to get out your antique silver to make your holiday table sparkle, there are a few things you need to know before you get down to the chore of cleaning and polishing that silver. Before cleaning or polishing silver, it is important to inspect each object for hallmarks or other identifying marks that will tell you if the piece is sterling or silver plate. Also look at how the item is constructed. If there are solder joins or hollow sections in handles or feet, the object should not be immersed in a cleaning agent or water. The object should also be checked for the presence of decorative gilding or other surface inlays. Special care is needed to spot-clean these delicate and sometimes fugitive (less stabile) surfaces. There are a number of different commercial products for cleaning silver: cloth; liquid; cream; paste; and foam are common products that are easily available. There are a number of different commercial products out there for cleaning silver: cloth; liquid; cream; paste; and foam are common products that are easily available. Do not use non-specific, all-purpose metal polishes because these contain harsher abrasives and may cause damage to the silver finish. Commercial products that are formulated for home use are the safest method for frequent cleaning of silver. As with any method, cleaning and polishing agents contain abrasives. Be sure to close the containers tightly after use because the cleaner can dry out, making the polish more abrasive. 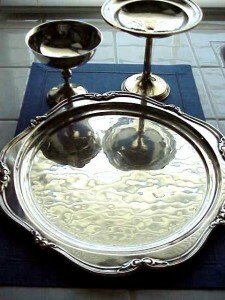 Over time, the cleaning process does remove some silver along with the tarnish and leave fine scratches on the surface. It is advisable to use the least invasive cleaning agent necessary, so that you remove only the layer of tarnish from the piece. Most commercial silver polishes contain a tarnish inhibitor. While this slows the tarnishing rate for a short time, when objects do start to tarnish they do so unevenly. Many museums and conservators make their own polishing paste using precipitated chalk (calcium carbonate) and distilled water. Sometimes referred to as “whiting,” calcium carbonate is a superfine ground white powder that mixes easily with distilled water, and is available at most chemical supply companies and hardware stores. When using this method, it is important to have a light hand when polishing. Calcium carbonate acts as an abrasive in the cleaning process. Care has to be taken to mix a thin paste with enough abrasion to remove the tarnish without leaving scratches in the surface. After polishing, there can be a residue of abrasive particles left on the surface that should be removed by rubbing with a soft cloth or brushing with a soft brush and should not be used on gilded or inlaid surfaces. Liquid dip is a chemical mixture that, in theory, attacks the tarnish and not the silver. A dip may not be the best answer for cleaning heavily engraved surfaces because it can remove the darker in-fill on the engraved texture, leaving the silver looking flat. It is recommended that rather than submerging the object in the liquid, the dip be applied briefly to the item with a cotton-tipped applicator. Rinse in distilled water to remove any excess dip and then dry. Prolonged use of dips is not advisable, as this can lead to surface pitting. Also, chemical dips should not be used on silver pieces that have hollow sections (candlesticks or teapots with hollow handles) because once liquid leaks into a cavity, it is virtually impossible to wash it out. Remember, too, that dips are composed of an acid that is corrosive and can damage bronze, stainless steel knife blades, and organic materials, such as wood and ivory. When using dips, it is important to work in a well-ventilated area and to wear rubber gloves. 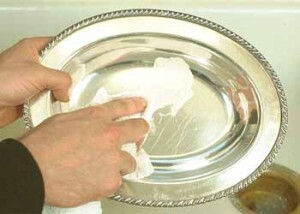 If, after cleaning, there is a slight yellowish cast to the silver, rub the object gently with a silver polishing cloth. Wadding polish is cotton wool or batting that contains an abrasive and is moistened with an organic solvent instead of water. It is useful for objects that should not be exposed to water. However, wadding leaves behind a residue of abrasive particles on the surface that should be removed by rubbing with a soft cloth or brushing with a soft brush and should not be used on gilded or inlaid surfaces. Silver that is used will eventually end up with some scratches and dents. It is generally a good idea to simply accept this cosmetic damage as a sign of character and use. If a major dent occurs on a piece that is frequently polished, prolonged handling will thin the metal and make repairs more difficult. If this happens, consult a conservator. Douglas Eisele is the founder and owner of Old World Restorations in Cincinnati, Ohio.